This stunning semi-circular cabinet from our Moc Croc range is a chic and unique storage solution, designed in a classic Art Deco style. A solid wooden frame with four strong legs is hand finished with a faux leather silver Moc Croc finish, and the cabinet features ample storage space with a handy shelf. Ideal for storing all manner of things large or small, this piece will be equally at home in the bedroom or lounge as it would be in an office, study or hallway. This piece is delivered fully assembled, so check the measurements before ordering to make sure it will fit through any doors and into the desired location. 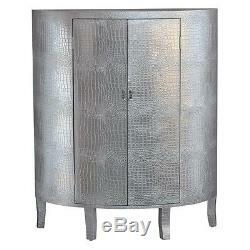 A silver semi-circular cupboard with Moc Croc finish. Silver door handles with magnetic catches. Inside the cupboard is lined with dark coloured material. Pairs well with other pieces in the Moc Croc collection. You can pay for your item as follows. Please note that a lot of our items are'Antique Reproductions' and with that may come certain imperfections or fading, and are deliberate effects of the style. All items are handmade and hand-finished, which sometimes results in slight variations between pieces. It is natural to expect and appreciate these discrepancies as a feature of our products. Please also be wary that colours may vary slightly to the pictures shown on our website. 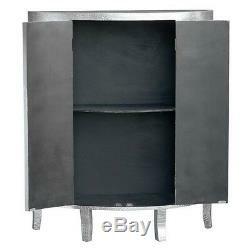 The item "Silver Moc Croc Embossed Large Cabinet with shelf 100 x 40 x 120cm DUSX" is in sale since Monday, January 30, 2017.